The Vancouver Canucks top line. 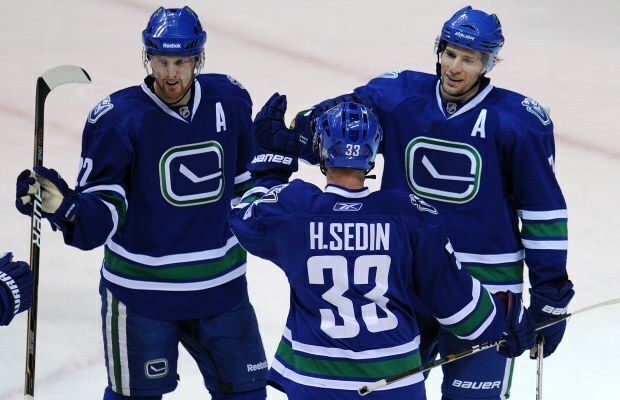 Daniel Sedin, Henrik Sedin and Ryan Kesler. The Vancouver Canucks will continue their Pacific Division swing tonight as they once go up against the San Jose Sharks. The Canucks are looking for their first win of the season against the Sharks. Scratch that, the Canucks are looking for their first win against the Sharks after 9 (!) straight losses. This is the third of four games between the two teams this season, with the Sharks obviously winning the first two, both by a 4-1 score. After winning 10 of their first 12 games, the Sharks have lost 3 straight now. Although, they’ve at least picked up a point in each one. In fact, they’ve picked up at least a point in 14 of their first 15 games this season. Their only loss in regulation so far was against the Boston Bruins in Boston a couple of weeks ago. As for the Canucks, they’ve lost 2 of their last 3 games (1-1-1). The Canucks’ top line of Daniel Sedin-Henrik Sedin-Ryan Kesler continue to be hot. Daniel has 9 points (5 goals – 4 assists) in a 7-game point streak, Hank is on a career-high 12-game point streak (3 goals – 14 assists), and Kes has points in 7 of his last 8 games (6 goals – 4 assists – 10 points). Roberto Luongo has also been playing well. He has a 0.950 save percentage in his last 3 games. For the Sharks, Joe Pavelski is on a 4-game point streak (3 goals – 1 assist – 4 points) and leads the Sharks in scoring with 17 points (6 goals – 11 assists). The Vancouver Canucks are still without forwards Jordan Schroeder, Jannik Hansen, Dale Weise and David Booth. Booth is on a conditioning assignment in Utica, and isn’t expected to return until mid-November. The San Jose Sharks are expected to play without forward Brent Burns (mouth). Forwards Adam Burish and Raffi Torres are both recovering from surgery and will not be playing.